Furnace FAQ: What’s That Odor? With the cooler weather settling in for the fall season, it is time to start thinking about the performance of your home heating system. You are not going to be running your heater with great regularity just yet, of course, but it won’t be long before chilly nights have you dialing the thermostat up to comfortable levels. If you turn on your furnace for the first time this year, only to be hit with an odd odor, you may have a problem on your hands. There are a few reasons as to why your furnace in Madera, CA may emit a strange odor. Not all of the them are terribly serious. Some are, though, so having the system and the situation assessed and evaluated by a trained professional may be necessary. Posted in Heating | Comments Off on Furnace FAQ: What’s That Odor? What Are You Waiting For? Now Is the Time for a Furnace Tune-Up! We’ve got a considerable amount of warm, sunny days ahead of us. That doesn’t mean that you can afford to ignore the fact that the coldest time of the year is coming, though. If you want to ensure that you are able to live comfortably throughout our winter season, then you need to know for certain that your heater is ready for action. The furnace is one of the most popular of all home heating systems, and it’s easy to see why. After all, modern furnaces are quite efficient, affordable to purchase, and, most importantly, they’re effective. Of course, the only way that you can hope to get the most from your furnace is to schedule a professional furnace tune-up in Kingsburg, CA. Posted in Heating | Comments Off on What Are You Waiting For? Now Is the Time for a Furnace Tune-Up! Buying a new furnace is similar to buying a car. You want to know the fuel efficiency, of course, and compare features and equipment of different models. Though, unlike a car, you can’t take your new furnace for a test drive. With that in mind, it’s important to work with a reputable HVAC provider to maximize your investment with a successful installation. Your ductwork system carries conditioned air throughout your home to maintain your desired comfort level. Any areas where insulation is torn can affect the efficiency of your furnace system, making your furnace work harder. This equates to higher energy costs and lower efficiency. And during the warmer season, moisture condensation buildup can actually damage the duct system itself. Can Putting in a Furnace Filter the Wrong Way Cause Damage? Furnace filter screens are designed to be placed a certain way, and not heeding this proper direction can cause issues. By taking a few moments to ensure your filter is placed the right way, these headaches can simply be avoided. Posted in Furnaces | Comments Off on Can Putting in a Furnace Filter the Wrong Way Cause Damage? To ensure comfort and optimal efficiency, your home’s furnace must be sized accurately just like the air conditioner. Instead of using a rule of thumb to estimate the size, an HVAC contractor should perform a load calculation and consider key factors such as the home’s square footage, orientation, insulation level, windows and ductwork system. The cost of a furnace installation can vary depending on what type of furnace you are going to purchase. Variables include the efficiency level of the furnace, its brand and model, and whether it’s electric, natural gas, propane or oil. 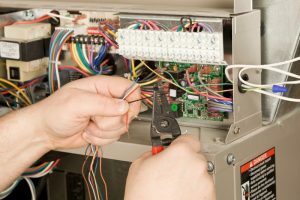 The cost of furnace installation also can be affected by how easy your current furnace is to access and remove.